Enjoy three days of beer-infused learning and fun in New Hampshire's White Mountains at the annual New England Brewfest. Photo courtesy of New England Brewfest. Calling all beer fans! Now’s the time to plan your summer travels to New England’s best beer festivals. New England and beer go together like Kentucky and bourbon or the Napa Valley and wine. Attend one—or all—of these New England summer beer festivals, and you’ll discover what makes this region a magnet for beer lovers. 1. Brattleboro Brewers Festival: May 27, 2017, 12-4 p.m. This annual festival brings together top brewers from Vermont and beyond for a fun afternoon of live music and beer sampling. Be first to taste new releases from participating breweries, and pair your favorites with food available from several vendors. Save money by purchasing your tickets online. Cash only is accepted for admission at the gate. Location: VABEC Fields, 40 University Way off Old Guilford Road, Brattleboro, VT. This one-of-a-kind festival puts the emphasis back on small-batch brewing and is a must for beer connoisseurs. Meet brewers face-to-face: They’re required to be in attendance. And sip their freshest, most inventive creations including beers that will make their debut at the event. There will be more than 70 thoughtfully curated small producers of beer, cider, mead, kombucha and sake featured: Think of it like a juried art show! Tickets are selling out fast for the three tasting sessions, so reserve yours online. Location: Seaport World Trade Center, One Seaport Lane, Boston, MA. The Western White Mountains Chamber of Commerce brings you this 13th annual, three-day celebration of New England beer. Make plans now to enjoy a beer-infused weekend featuring social events, educational workshops, beer dinners, a brewers brunch and the main event: Saturday night’s ON TAP tasting session featuring more than 30 New England breweries serving their best and brand new brews. You’ll rub elbows with industry professionals and fellow beer lovers while eating, listening to live music and learning about the latest developments in craft brewing. There’s even a Sunday morning, non-denominational, beer-themed outdoor church service for true brew believers. Location: Various locations in Woodstock and Lincoln, NH. ON TAP event is slopeside at the Governor’s Lodge at Loon Mountain Resort, 60 Loon Mountain Road, Lincoln, NH. Did you know Vermont has more breweries per capita than any other U.S. state? That makes a beer festival in Vermont featuring the state’s and the Northeast’s finest craft brewers worth the trip from anywhere. This year, the Vermont Brewers Festival celebrates its 25th anniversary with four tasting sessions that are selling out fast. 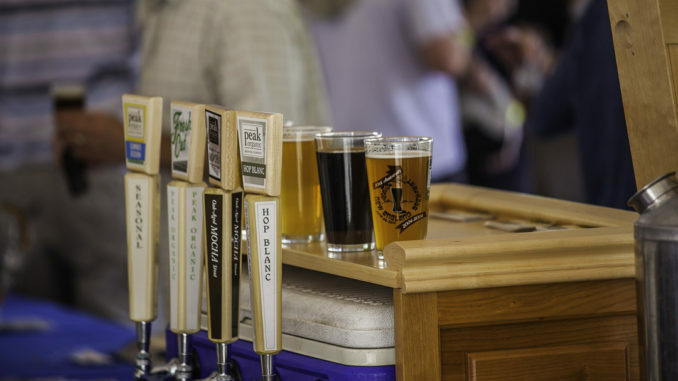 Held rain or shine on the stunning Lake Champlain waterfront and presented by the Vermont Brewers Association, this annual festival celebrates Vermont food, too. Location: Waterfront Park, 20 Lake Street, Burlington, VT.
5. Maine Brewers’ Guild Summer Session Beer Festival: July 29, 2017, 1-5 p.m.
Beer and lobster rolls. Does it get any better? This outdoor summer beer festival is the ultimate celebration of Maine’s leading role in the craft beer movement. Sixteen new breweries opened in Maine last year alone. In addition to discovering new favorite brews from nearly every Maine brewery plus some out-of-state guests, enjoy live music, food truck temptations and mini educational sessions with Maine brewers. Location: Thompson’s Point, Portland, ME.